Somehow the gas had not run out and we got our morning cuppa but when Steve checked the tanks both were showing zero. We found a gas station in Portimao on the internet but no coordinates just an address. After driving through some tiny roads no gas station materialised so we pulled over and put coordinates into TomTom for Lidl at Albufeira hoping we would find gas on the way. Sure enough just after we turned on to the main N125 there was a large Repsol Garage with GPL and a better price than Margaret had told us they had paid in Portimao. Also on the right side for our filler which is sometimes a problem. We had been low it took 40.5 litres, the most we have ever put in. 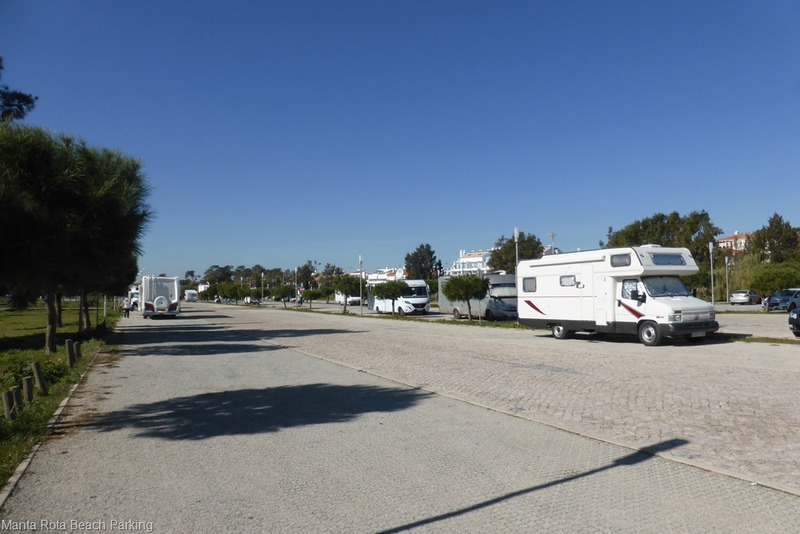 The Lidl store at Albufeira was the biggest we had ever come across and lots of very easy parking as well as four designated Motorhome places where we believe they are happy for motorhomes to stay overnight. After shopping we set Tom to the coordinates of the nice clifftop place we had enjoyed last year. It was still there with a few campers dotted around and we found exactly the same place with beautiful views out to sea. We had come here with nice full tanks as Steve had some bookwork and tax payments to make with a deadline and we knew that there was a good signal for getting the internet with our MiFi internet device. Also it was quiet and Judy could sit out and read if the weather was warm enough. The forecast said sunny but cold though. We woke on Thursday morning and opened the blinds to absolute chaos. A Portuguese TV film unit had arrived with a huge make-up wagon, two large equipment lorries a generator and dozens of cars and vans filling the whole area. Behind us the caterers had their lorry and were erecting large dining gazebo’s and a kitchen tent. In a previous life we had worked in the TV industry and realise that it takes about fifty people all day to shoot a five minute outside scene so the chaos didn’t really surprise us but it was entertaining to watch so many people hanging around with only a few seeming to do anything. It was a bit distracting for Steve though trying to concentrate on getting the paperwork done. As usual we totally forgot to take any photos it was very cold outside so we just sat in our motorhome and watched the chaos in our little tranquil wild camping spot. By about 6:30 all the vehicles has disappeared and the tranquillity returned. Friday we woke to a smattering of rain which could be a problem as there was a steep slope to drive out which possibly could be muddy and slippery in the rain. The sun came out and it was dry by about 1pm so we decided that as more rain was forecast it would be better to move to somewhere with hard standing. 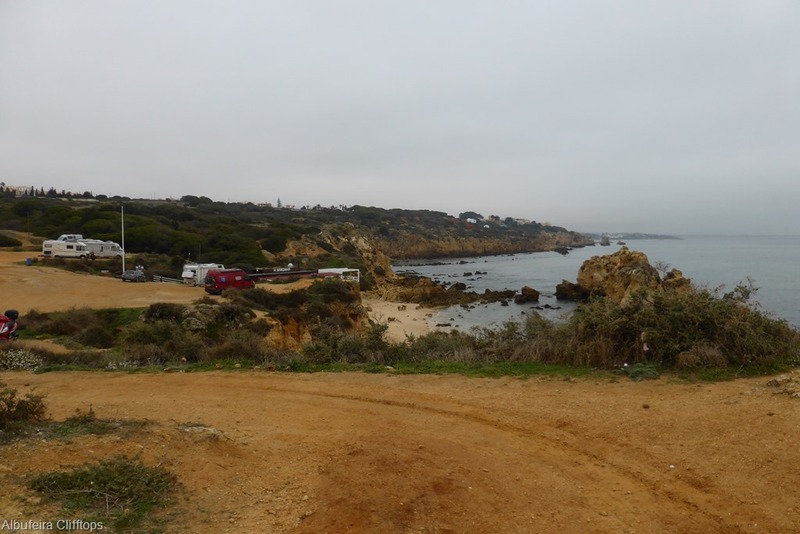 We had planned to return to the beach we had enjoyed at Quarteira stopping at the large motorhome parking to empty down but changed our minds at the very last minute and re-set the coordinates to the camper stop at Manta Rota which was paved and would be no problem if it did rain. We arrived at Manta Rota camper stop at about 3:30pm but it had a full sign on the entry barrier, oops. But we knew that there is a large parking area about 100 yards away where motorhome parking is tolerated so turned around and parked up there with about twenty other motorhomes. That’s us behind the large white one. I think the silver colour is much less noticeable. Hopefully we can stay here for the weekend and investigate a little. We Missed the Mardi Gras!